Acanthamoeba spp. can cause serious human infections, including Acanthamoeba keratitis, granulomatous amoebic encephalitis and cutaneous acanthamoebiasis. 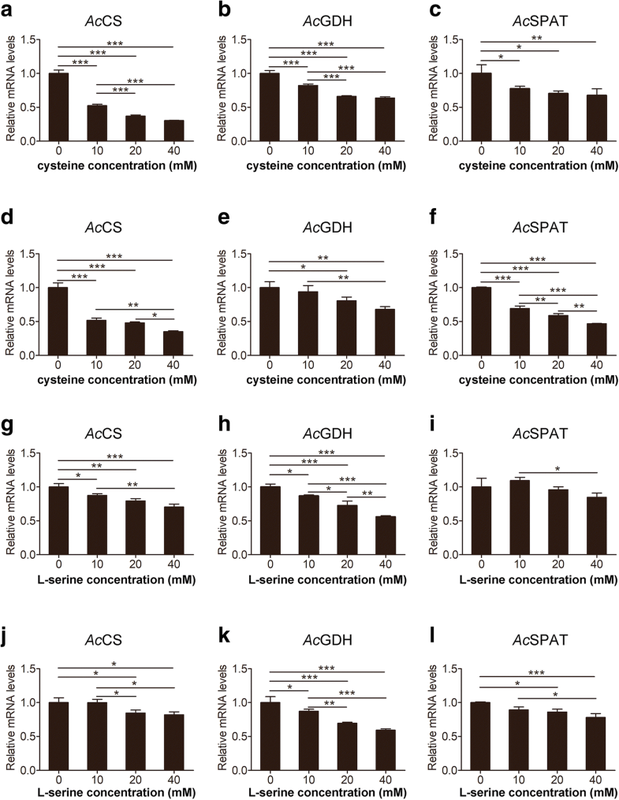 Cysteine biosynthesis and the L-serine metabolic pathway play important roles in the energy metabolism of Acanthamoeba spp. However, no study has confirmed the functions of cysteine synthase (AcCS) in the cysteine pathway and phosphoglycerate dehydrogenase (AcGDH) or phosphoserine aminotransferase (AcSPAT) in the non-phosphorylation serine metabolic pathway of Acanthamoeba. The AcCS, AcGDH and AcSPAT genes were amplified by PCR, and their recombinant proteins were expressed in Escherichia coli. Polyclonal antibodies against the recombinant proteins were prepared in mice and used to determine the subcellular localisation of each native protein by confocal laser scanning microscopy. The enzymatic activity of each recombinant protein was also analysed. Furthermore, each gene expression level was analysed by quantitative PCR after treatment with different concentrations of cysteine or L-serine. The AcCS gene encodes a 382-amino acid protein with a predicted molecular mass of 43.1 kDa and an isoelectric point (pI) of 8.11. The AcGDH gene encodes a 350-amino acid protein with a predicted molecular mass of 39.1 kDa and a pI of 5.51. The AcSPAT gene encodes a 354-amino acid protein with a predicted molecular mass of 38.3 kDa and a pI of 6.26. Recombinant AcCS exhibited a high cysteine synthesis activity using O-acetylserine and Na2S as substrates. Both GDH and SPAT catalysed degradation, rather than synthesis, of serine. Exogenous L-serine or cysteine inhibited the expression of all three enzymes in a time- and dose-dependent manner. This study demonstrated that AcCS participates in cysteine biosynthesis and serine degradation via the non-phosphorylation serine metabolic pathway, providing a molecular basis for the discovery of novel anti-Acanthamoeba drugs. Free-living amoebae of the genus Acanthamoeba are widespread protozoans that exist as vegetative trophozoites and dormant cysts during their life-cycle . Some Acanthamoeba species cause accidental infections, such as Acanthamoeba keratitis , fatal granulomatous amoebic encephalitis or cutaneous infections in immunosuppressed individuals . The number of reported cases worldwide is increasing every year. Despite the medical importance of these parasites, however, few antimicrobial agents are available for treatment . Amino acid metabolic pathways are potential drug targets in some infectious diseases. L-cysteine is a sulphur-containing amino acid that plays an important role in the structure, stability, catalytic activity and regulation of numerous proteins [5–9]. This amino acid is also involved in the synthesis of many other important biomolecules, such as glutathione, thiamine, taurine, lipoic acid, biotin and coenzyme A. Therefore, its synthetic pathways represent an attractive drug target for treatment. Cysteine can be generated from methionine through the transsulphuration pathway in mammals  and fungi  or from serine and inorganic sulphide. The latter pathway is also known as sulphur assimilation and occurs in bacteria , plants  and a few protozoa, such as Entamoeba histolytica  and Trypanosoma cruzi . This pathway comprises two catalytic steps that are initiated by serine acetyltransferase (SAT) to form O-acetylserine (OAS) from L-serine and acetyl-coenzyme A. OAS reacts with sulphide to generate cysteine, and this step is catalysed by cysteine synthase (CS, OAS thiolyase) . To date, the presence of the sulphur assimilation/cysteine biosynthetic pathway in A. castellanii remains unclear. However, in a previous study, we confirmed the existence of a phosphorylated serine biosynthetic pathway in this organism . Phosphoglycerate dehydrogenase (PGDH) catalyses the first step of this pathway by oxidising 3-phosphoglycerate to 3-phosphohydroxypyruvate (3-PHP) using NAD+/NADH as a cofactor. Phosphoserine aminotransferase (PSAT) catalyses the reversible conversion of 3-PHP to phosphoserine, which is then dephosphorylated by phosphoserine phosphatase to form L-serine . Serine is a cysteine precursor in the sulphur assimilation/cysteine biosynthetic pathway of nearly all organisms, including protozoa. Hence, serine metabolic pathways are important in the regulation of cysteine levels. To understand the role of serine metabolism and sulphur-containing cysteine biosynthesis in A. castellanii, we searched the Kyoto Encyclopaedia of Genes and Genomes database and created a list of potential enzymes based on the available pathway information. Then, we successfully cloned the gene of D-glycerate dehydrogenase (GDH) and serine-pyruvate aminotransferase (SPAT) from A. castellanii and demonstrated that this amoeba possesses phosphorylated and nonphosphorylated pathways for serine metabolism. We extended this work by cloning the CS gene of A. castellanii. However, we could not identify the gene for SAT, which is absent in this organism because no homologous genes could be found for it. This finding demonstrates that A. castellanii possesses a cysteine biosynthetic pathway involving CS but not SAT. Humans lack CS; thus, this parasitic enzyme could be a target for the rational design and screening of anti-Acanthamoeba agents. To the best of our knowledge, this work is the first to report on the non-phosphorylated pathway for serine metabolism and CS-mediated cysteine biosynthesis in a free-living amoeba. All chemicals were of analytical grade and purchased from Sigma-Aldrich (Shanghai, China), unless stated otherwise. Acanthamoeba castellanii (strain ATCC30011) was obtained from the American Type Culture Collection, and trophozoites were routinely grown axenically in peptone-yeast-glucose (PYG) medium . Cultures were incubated at 26 °C, and trophozoites were harvested in the late log phase after subculture for 72 h.
Total A. castellanii RNA was extracted from trophozoites using RNeasy® Plus Mini Kit (Qiagen, Hilden, Germany), and complementary DNA (cDNA) was synthesised using a PrimeScript® 1st strand cDNA synthesis kit (Takara, Kusatsu, Japan). The CS, GDH and SPAT genes were amplified by PCR using the primers listed in Table 1. PCR was performed in a 9902 Veriti 96-well Thermal Cycler (Applied Biosystems, Waltham, USA) (94 °C for 3 min; 35 cycles of 94 °C for 15 s, 55 °C for 30 s and 72 °C for 1 min; followed by 72 °C for 5 min). The amplified PCR product was purified and ligated into a pMD19-T Vector (Takara), and the nucleotide sequence was obtained by automated sequencing. The correct plasmids were amplified with primers containing NdeI and BamHI restriction site sequence, and the PCR products were ligated into pET19b. The sequences of all constructs were confirmed on both strands and analysed with Vector NTI software (Invitrogen, Waltham, USA). Plasmids were transformed into E. coli BL21(DE3) pLysS for protein expression, and recombinant CS, GDH and SPAT proteins were purified using a QIA Express kit in accordance with the manufacturer’s instructions. The purity and mass of each protein was determined by sodium dodecyl sulphate polyacrylamide gel electrophoresis. The concentrations of recombinant proteins were measured using a protein assay (Bio-Rad, Hercules, USA). Each purified recombinant protein was injected intraperitoneally into BALB/c mice. In brief, 50 μg of protein was mixed with Freund’s complete adjuvant for the first injection, and Freund’s incomplete adjuvant was used for the next two immunisations at 2-week intervals. One week after the final injection, serum was collected from the mice. Total crude protein from A. castellanii trophozoites (5 μg) and aliquots of purified CS, GDH and SPAT (1 μg) were blotted on a nitrocellulose membrane . Recombinant Babesia microti merozoites (BMSA)  and antigen extracts from Dermatophagoides farinae (Derf 2; stocks from our laboratory, 1 μg) were used as negative controls. Filter strips were blocked with 3% skimmed milk powder in PBS and then incubated with 1:50 diluted anti-AcCS, anti-AcGDH or anti-AcSPAT mouse sera. Horseradish peroxidase-conjugated (HRP) goat anti-mouse IgG (Cappel, Chester, USA) was used as a secondary antibody. Proteins were visualised using an enhanced HRP-DAB substrate detection kit (Tiangen Biotech, Beijing, China). Acanthamoeba castellanii trophozoites at a density of 2 × 105 cells/ml were used for confocal microscopy. To assess colocalisation of native AcGDH and AcSPAT, the trophozoites were incubated for 1 h with a mouse anti-AcGDH polyclonal antibody (1:50 dilution with 3% skimmed milk powder in PBS), followed by 1 h with an Alexa Fluor 488 goat anti-mouse IgG1 (H + L; Abcam, Cambridge, USA) as a secondary antibody. Next, an anti-AcSPAT mouse polyclonal antibody (1:50 dilution) was used to react with native AcSPAT for 1 h, followed by an Alexa Fluor 568 goat anti-mouse IgG2b (H + L; Abcam) as a secondary antibody for 1 h. The cells were also stained with 0.25-mg/ml 4',6-diamidino-2-phenylindole (DAPI) and 1.25-mg/ml 1,4-diazabicyclo[2.2.2]octane (DABCO, in 10 % glycerol-PBS) for 10 min. For AcCS localisation, the cells were incubated for 1 h with anti-AcCS mouse polyclonal antibody (1:50 dilution) used as a primary antibody, followed by 1 h with an Alexa Fluor 488 goat anti-mouse IgG1 (H + L; Abcam) used as a secondary antibody. Propidium iodide was used to stain nuclei. Cell suspensions containing 2 × 104 cells were placed onto glass slides, mounted with coverslips and examined using a Leica TCS SP8 (Wetzlar, Germany) microscope. CS activity was measured as described by Westrop et al. . Briefly, reaction mixtures contained 50 mM Tris-HCl (pH 7.5), 0.2 mM pyridoxal 5'-phosphate, 20 mM OAS, 2 mM Na2S and the corresponding recombinant CS protein. Reactions were stopped by adding 50 μl of glacial acetic acid (> 99.9%), and the formation of cysteine was quantified by the method described by Gaitonde . The Km for OAS was determined using 3 mM Na2S and by varying the concentration of OAS between 10 and 100 mM. The Km of Na2S was determined using 30 mM OAS and by varying the concentrations of Na2S between 0.1 and 12.8 mM. GDH activity was determined in both forward and reverse directions . Briefly, the reactions contained 20 mM sodium phosphate buffer (pH 6.5), 300 mM NaCl, 0.2 mM NADPH, 0.2 mM dithiothreitol (DTT), 10 mM lithium β-hydroxypyruvic acid (hydroxypyruvate, HP) and the purified protein. The Km for HP was determined using 1.4 mM NADPH and by varying the concentration of HP between 7.5 and 90 mM. The Km of NADPH was determined using 22.5 mM HP and by varying the concentrations of NADPH between 0.4 and 8 mM. In the reverse reactions, the reactions contained 50 mM Tris-HCl buffer (pH 8.5), 300 mM NaCl, 0.2 mM DTT, 10 mM NADP+, 10 mM hemicalcium D-glyceric acid (glycerate) and the protein. The Km for glycerate was determined using 30 mM NADP+ and by varying the concentration of glycerate between 100 and 1000 mM. The Km of NADP+ was determined using 150 mM glycerate and by varying the concentrations of NADP+ between 20 and 240 mM. Serine-pyruvate aminotransferase activity was detected as described by Snell et al. . Briefly, reaction mixtures contained 50 mM Tris-HCl buffer (pH 8.5), 20 mM L-serine, 20 mM sodium pyruvate and 40 μM pyridoxal 5′-phosphate (PLP), and the reaction was initiated by adding purified SPAT protein. After incubation for 30 min, 70% (w/v) HClO4 was added to stop the reactions. Subsequently, active AcGDH proteins were used to assess HP generation. The Km for serine was determined using 4 mM pyruvate and by varying the concentration of serine between 0.125 and 5 mM. The Km of pyruvate was determined using 0.5 mM serine and by varying the concentration of pyruvate between 2 and 25 mM. The kinetic constants reported for all assays are the means of at least three independent determinations, and Km and Vmax values were estimated using Michaelis-Menten and Lineweaver-Burk plots in conjunction with non-linear regression using GraphPad Prism v.5.01. Turnover numbers (kcat s-1) were calculated using the molecular mass of one subunit of each protein. Trophozoites were seeded in a 24-well plate (Eppendorf, Hamburg, Germany) at a density of 1 × 105 cells/ml in PYG medium . L-serine or cysteine were added at concentrations of 10, 20 and 40 mM, followed by incubation at 26 °C. Trophozoites were collected after 12 and 24 h of incubation, and total RNA was extracted. Real-time quantitative PCR was performed to analyse AcCS, AcGDH and AcSPAT gene expression. The primers used are shown in Table 1. All statistical analysis was performed using GraphPad 5 software (San Diego, CA, USA). Significance was calculated by one-way ANOVA analysis followed by a Tukey test. Data were expressed as the mean ± standard deviation (SD) and at least three independent experiments were performed for each sample. P < 0.05 was considered to be significant. The sequences of GDH and SPAT with the accession numbers LC154947 and LC154948, respectively, have been submitted to the GenBank database, whereas the sequence of CS is still under submission. The CS gene contains a 1149-bp open reading frame (ORF) that encodes a 382-amino acid protein with a predicted molecular mass of 43.1 kDa and an isoelectric point (pI) of 8.11. The GDH gene contains a 1053-bp ORF that encodes a 350-amino acid protein with a predicted molecular mass of 39.1 kDa and a pI of 5.51. The SPAT gene contains a 1062-bp ORF encoding a 354-amino acid protein with a predicted molecular mass of 38.3 kDa and a pI of 6.26. 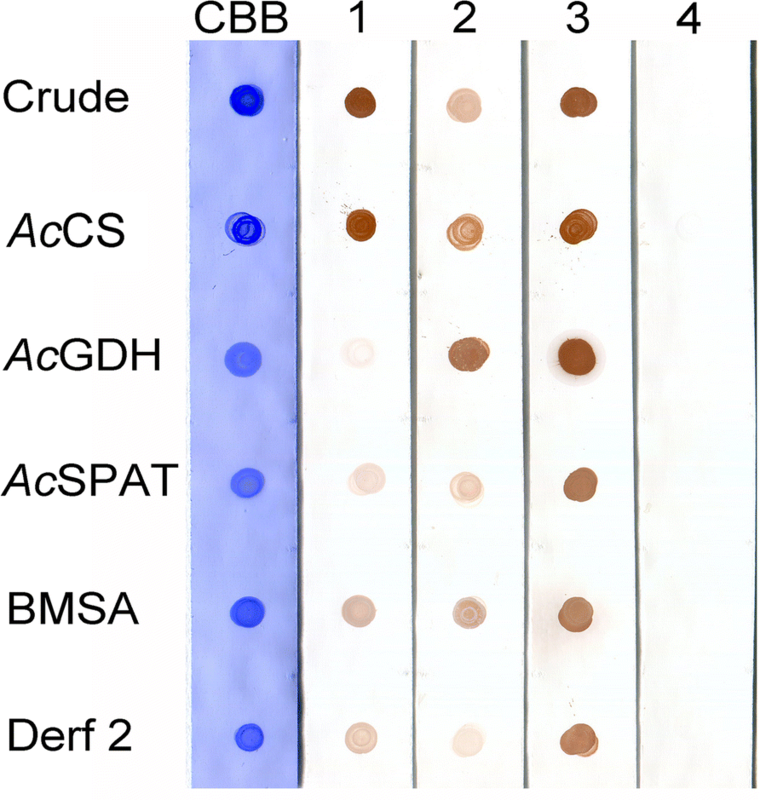 The reactivities of polyclonal antibodies raised against AcCS, AcGDH and AcSPAT were assessed by a dot blot analysis (Fig. 1). Crude (5 μg) and recombinant proteins (1 μg) were spotted on a nitrocellulose membrane, and the crude antigens in strips 1, 2 and 3 exhibited strong immunoreactivity, indicating that the polyclonal antibodies recognised the respective proteins in trophozoites. However, the anti-AcSPAT polyclonal antibody exhibited cross-reactivity with both CS and GDH recombinant proteins. No immunoreactivity was observed in normal mouse serum to any of the spotted antigen. To determine the localisation of native CS, GDH and SPAT in A. castellanii, confocal laser scanning microscopy was performed using anti-CS, anti-GDH and anti-SPAT mouse polyclonal antibodies (Fig. 2). AcCS was found to be localised to the inner part of the cell membrane (Fig. 2b), AcGDH and AcSPAT appeared to be colocalised (Fig. 2i) to the inner part of the cell membrane and to the membranes surrounding the nucleus. To assess the potential role of CS in cysteine biosynthesis, its sulphydrylase activity was tested. Recombinant AcCS could readily catalyse cysteine synthesis using OAS and Na2S as substrates and showed a high affinity for both substrates (Fig. 3). The enzyme was highly active in the pH range of 7.0 to 7.5. The AcGDH activity was measured in both forward and reverse directions. In the forward reaction, GDH catalyses the reduction of HP to glycerate using NADPH as a cofactor, whereas in the reverse reaction, it converts glycerate to HP using NADP+ as a cofactor. Recombinant AcGDH exhibited a higher affinity for HP than for glycerate as Km for glycerate was 10-fold higher than Km for HP (Table 2). Concordantly, the apparent Km of NADP+ was higher than Km of NADPH; however, the specific activity was 10-fold higher with NADP+ than with NADPH. In the forward reaction, AcGDH exhibited a high activity in the pH range of 6.0–6.5, and in the reverse reaction, AcGDH showed the highest activity in the pH range of 7.8–8.5. These data suggest that AcGDH specifically catalyses the conversion HP to glycerate. SPAT catalyses the conversion of pyruvate to HP using L-serine as an amine donor; in the reverse reaction, it converts HP to pyruvate using alanine as an amine donor. However, we could not test for the conversion of HP to pyruvate because the addition of lactate dehydrogenase would be required to monitor HP generation. The optimal pH for AcSPAT was 8.0–8.5, and its specific activity was 6.99 and 13.17 mmol/min/mg protein with pyruvate and serine, respectively, suggesting that AcSPAT could transform both serine and pyruvate. To obtain further evidence that AcCS is involved in cysteine biosynthesis and to verify that AcGDH and AcSPAT participate in the serine degradation pathway in A. castellanii, exogenous cysteine or serine were added to the culture medium of trophozoites and subsequent gene expression levels of these enzymes were assessed using quantitative PCR (Fig. 4). AcCS, AcGDH and AcSPAT expression was significantly downregulated by cysteine in a dose-dependent manner after treatment for 12 or 24 h, and no significant difference in their expression was observed between these two time points. AcCS and AcGDH expression was also significantly inhibited by L-serine in a dose-dependent manner after incubation for 12 or 24 h. However, AcSPAT expression slightly increased at treatment with 10 mM serine for 12 h but decreased at higher concentrations or after 24 h of treatment. This study is the first to report on the cysteine synthetic and non-phosphorylated serine metabolic pathways in A. castellanii. The properties of AcCS presented here provide molecular insights into cysteine biosynthesis in Acanthamoeba. The data showed that recombinant CS actively catalyses the generation of cysteine (Fig. 3) and that the enzyme mRNA level is substantially downregulated when trophozoites were treated by abundant exogenous cysteine treated (Fig. 4 a, d). These results demonstrate that AcCS participates in the synthesis of cysteine in Acanthamoeba. Sequence comparison (Additional file 1: Figure S1) revealed that AcCS possesses all of the conserved substrate-binding sites but lacks the β8-β9 surface loop, a domain that is conserved in the CS associated with SAT [25–27]. This finding reveals that AcCS does not form a regulatory complex with SAT in Acanthamoeba and is consistent with the lack of any evidence of a SAT homologue gene in the A. castellanii genome. SPAT catalyses the first step of the non-phosphorylated serine metabolic pathway by transforming pyruvate to HP using serine as an amine donor . GDH then catalyses HP reduction to glycerate, and glycerate kinase uses ATP as a phosphate donor to phosphorylate glycerate and produce 2-phosphoglycerate, which then enters the glycolytic pathway . In the present study, we demonstrated that A. castellanii possesses SPAT and GDH in the non-phosphorylated serine metabolic pathway. The purified AcSPAT had a specific activity of 13.17 ± 0.19 mmol/min per mg of protein for serine and showed a low Km when pyruvate was used as the substrate (Table 2). Such results indicate that AcSPAT actively degrades L-seine to HP in A. castellanii. Moreover, the apparent Km of D-glycerate and NADP+ was higher than that of HP and NADPH, indicating the strong partiality of the GDH of this amoeba toward HP and NADPH as substrates compared with D-glycerate and NADP+. These data reveal that GDH may prefer to degrade, rather than generate, serine, consistent with the role of EhGDH in E. histolytica . AcGDH and AcSPAT colocalise in the inner part of the cell membrane and in the membranes surrounding the nucleus (Fig. 2), thus suggesting that they have similar physiological functions and that they can enter the nucleus of Acanthamoeba to participate in metabolic reactions. A parallel phenomenon, in which plant-like glycolytic enzymes can enter the nucleus, has been observed in Toxoplasma gondii . The presence of the cysteine synthetic and non-phosphorylated serine metabolic pathways indicates that these protozoa have a high requirement for cysteine, perhaps for growth, attachment and pathogenicity, similar to its functions in E. histolytica  and T. cruzi . In contrast to E. histolytica and T. cruzi, protozoans such as Giardia intestinalis, Plasmodium falciparum and Cryptosporidium parvum , lack both SAT and CS, perhaps because they do not have such a high requirement for cysteine or can absorb sufficient amounts of the amino acid from their hosts. Since different physiological functions exist in the cysteine metabolism pathway of protozoans, this metabolic pathway has been considered to be a potential drug target in some infectious diseases. For instance, in Trichomonas vaginalis and E. histolytica, CS is essential for cysteine synthesis from sulphide, and this parasitic enzyme could be an exploitable drug target because humans lack CS and the sulphur assimilation/cysteine biosynthetic pathway is absent from mammalian hosts [21, 31]. In T. brucei, an inhibitor of S-adenosylmethionine decarboxylase, was found to be highly effective against infections in mice ; methionine adenosyltransferase is also used therapeutically in T. brucei rhodesiense infections . Moreover, Plasmodium S-adenosylhomocysteine hydrolase provides a practical target for antimalarial drugs . However, in-depth investigations should be performed to confirm whether the cysteine synthetic or non-phosphorylated serine metabolic pathways could also be novel targets for the development of new drugs against acanthamoebiasis. Unlike parasitic protozoa, free-living amoebae must immediately adapt to changing environmental conditions, such as starvation, increased osmolarity, extreme pH or temperature and oxygen depletion [2, 34]. Physiological features may be ascribed to the complex energy metabolism of trophozoites and cysts. Acanthamoeba trophozoites feed as aerobic protozoa in the presence of sufficient oxygen; however, under anoxic conditions, many free-living protists switch between aerobic and anaerobic metabolism . A. castellanii possesses a complex energetic and respiratory system in which glycolysis  associated with aerobic mitochondria  and a hydrogenosomal-type anaerobic ATP generation pathway  function together to maintain its energy requirements. Moreover, A. castellanii prefers the anaerobic pathway for energy production , thus indicating that glycolysis may be an important energy metabolic pathway in Acanthamoeba. However, glycolysis does not always function throughout the life-cycle of Acanthamoeba. Fructose-bisphosphate aldolase and enolase are key enzymes in glycolysis that are repressed during Acanthamoeba encystation , which suggests that glycolytic enzymes are expressed stage-specifically. The same phenomenon has been observed in Toxoplasma, where enolase 1 is expressed in bradyzoites and enolase 2 is expressed in tachyzoites . In E. histolytica, glucose-6-phosphate and fructose-6-phosphate are substantially depleted during encystation . In our previous study, AcPGDH and AcPSAT were also expressed stage-specifically . These enzymes were downregulated after treatment with L-serine or cysteine (Additional file 2: Figure S2), consistent with the AcCS, AcGDH and AcSPAT expression observed in this study. Serine, in conjunction with pyruvate, is located at the glycolysis gateway . Hence, we hypothesise that AcGDH and AcSPAT or AcCS are involved in glycolysis regulation in A. castellanii. Acanthamoeba castellanii hydrolyses glucose into pyruvate via glycolysis . Glucose is a major precursor for cellulose synthesis , and many studies have demonstrated that cellulose synthesis is essential for cyst formation . Thus, determining the role of glycolysis in cyst formation in A. castellanii is interesting [40, 44]. Analysis based on gene knockdown technology may provide an enhanced understanding of the roles of key enzymes, namely AcGDH, AcSPAT or AcCS, during cyst formation. This knowledge may also provide an opportunity to explore drug targets, particularly the cyst formation of A. castellanii. The pathogenicity of Acanthamoeba is related to its extracellular protease activities, and serine and cysteine proteases are the predominant extracellular proteases. Several serine and cysteine proteases have been identified in collagen degradation and corneal stroma invasion [2, 45]. Cysteine and serine are the catalytic residues at the active sites of these enzymes, and the influence of the activities of these enzymes on serine or cysteine biosynthesis has yet to be clarified. These observations, along with the fact that mammals do not perform sulphur assimilation/cysteine biosynthesis, indicate that the cysteine synthetic or nonphosphorylated serine metabolic pathway could be an attractive drug target for acanthamoebiasis treatment. The gene sequences of AcCS, AcGDH and AcSPAT were elucidated in this study. AcCS was involved in cysteine biosynthesis, whereas AcGDH and AcSPAT were involved in the non-phosphorylated serine degradation pathway and, therefore, in the glycolytic pathway of A. castellanii. This study is the first to provide molecular insights into the cysteine biosynthesis and non-phosphorylated serine metabolic pathways in free-living amoeba. Our results indicate the existence of the sulphur assimilation/cysteine biosynthetic pathway in the cysteine metabolism of A. castellanii and that AcGDH and AcSPAT may be involved in the energy metabolism, cyst formation and pathogenesis of Acanthamoeba. These findings could be further confirmed by studies using gene knockdown approaches or enzyme inhibitors. In summary, our data collectively suggest that AcCS can be a target for the rational design of anti-Acanthamoeba drugs. Duo Wu and Meng Feng contributed equally to this work. The authors wish to thank Jun-long Cai for helping us purchase reagents used in the study. This work was supported by the National Natural Science Foundation of China grant number 81572020 and by JSPS KAKENHI grant number JP16H05819. DW and XJC conceived and designed the study. DW performed the experiments and wrote the paper. MF performed image capture and sequence alignment. MF and HT helped with the study design. ZXW collected materials. XJC (and HT) revised the manuscript. All authors read and approved the final manuscript. This study was approved by the Institutional Animal Care and Use Committee of Fudan University, China (permit numbers: 201202019 and 20150119-112).